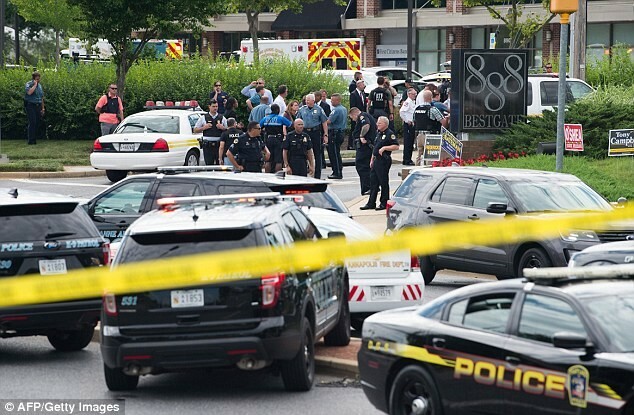 Law enforcement officials survey the scene after a gunman fired through a glass door at the Capital Gazette newspaper and sprayed the newsroom with gunfire, killing at least five people and injuring several others, in Annapolis, Maryland, U.S.
A man was charged with murder on Friday, local media in Maryland said, after a gunman carried out a rampage through a newsroom in Annapolis, with a shotgun, killing five people in one of the deadliest attacks on journalists in U.S. history. 38-year-old Jarrod Ramos from Laurel, about 25 miles (40 km) west of Annapolis, faces five counts of first degree murder in Anne Arundel County criminal court where a bail hearing is expected to be held for him on Friday morning, The Capital Gazette newspaper group reported on its website. Police had not released the name of the suspect, but online court records showed a man by the same name was charged with five counts of murder on Friday. Ramos is accused of entering the Capital Gazette newspaper group on Thursday afternoon and opened fire through a glass door, looked for victims and then sprayed the newsroom with gunfire, police and a witness said. 59-year-old Rob Hiaasen, 65-year-old Wendi Winters, 34-year-old Rebecca Smith, 61-year-old Gerald Fischman and John McNamara were shot and killed, the acting police chief of the Anne Arundel County Police Department, William Krampf, told a news conference. All were journalists except Smith who was a sales assistant, he said. Jarrod Ramos, suspected of killing five people at the offices of the Capital Gazette newspaper office in Annapolis, Maryland, U.S. is seen in this 2013 Anne Arundel Police Department booking photo obtained from social media. The Annapolis newspaper The Capital, part of the Gazette group, published an edition on Friday with photographs of each of the victims along with ‘5 shot dead at The Capital’ as a headline in large bold lettering on its front page. Ramos tweeted that he had set up a Twitter account to defend himself, and wrote in his biographical notes that he was suing people in Anne Arundel County and making corpses of corrupt careers and corporate entities. The newsroom looked like a war zone, he told the Baltimore Sun.